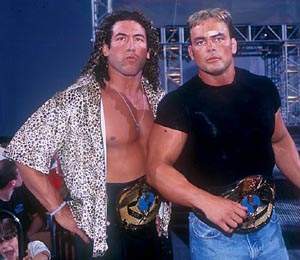 May 31, 2000 – Thunder: Chuck Palumbo & Shawn Stasiak defeated KroniK to win the WCW World Tag Team titles..
June 28, 2000 – Thunder: Captain Rection & Major Stash defeated Chuck Palumbo & Shawn Stasiak in a Non-title match..
July 5, 2000 – Thunder: Brian Adams & Woody Pierce defeated Shawn Stasiak & Chuck Palumbo in a Non-title match..
July 9, 2000 – Bash At The Beach: KroniK defeated Shawn Stasiak & Chuck Palumbo to win the World Tag Team Titles..
July 12, 2000 – Thunder: Shawn Stasiak & Chuck Palumbo defeated Corporal Cajun & Captain Rection by DQ..
July 24, 2000 – Nitro: Gen. Rection & Cpl. Cajun beat Rey/Disco and Jindrak/O’Haire and Stasiak/Palumbo in a 4-WAY..
August 9, 2000 – Thunder: WCW World Tag Team Champion KroniK defeated Chuck Palumbo & Shawn Stasiak..
September 17, 2000 – Fall Brawl: The Filty Animals vs The Natural Born Thrillers ended in a No-Contest..
September 18, 2000 – Nitro: Tygress & Rey Mysterio Jr. beat Mike Sanders & Stasiak & Palumbo in an Elimination match..
October 16, 2000 – Nitro: Mike Awesome & Crowbar defeated Chuck Palumbo & Shawn Stasiak..
October 18, 2000 – Thunder: KroniK (Brian Adams & Bryan Clarke) defeated Chuck Palumbo & Shawn Stasiak..
October 23, 2000 – Nitro: The Harris Brothers defeated Shawn Stasiak & Chuck Palumbo..
October 29, 2000 – Halloween Havoc: Lt.Loco & Cpl. Cajun defeated Shawn Stasiak & Chuck Palumbo..
October 30, 2000 – Nitro: KroniK (Brian Adams & Bryan Clarke) defeated Chuck Palumbo & Shawn Stasiak..
November 20, 2000 – Nitro: Shawn Stasiak & Chuck Palumbo beat Alex Wright & Elix Skipper to win the WCW Tag Team titles..
November 26, 2000 – : Kevin Nash & DDP defeated Chuck Palumbo & Shawn Stasiak to win the WCW World Tag Team titles..
December 4, 2000 – : Chuck Palumbo & Shawn Stasiak defeated Kevin Nash & DDP to recapture the WCW Tag Team titles..